There’s no recipe in this post. There’s no restaurant review. There’s not even a drool-worthy photo. In fact, there isn’t any food at all. Why? Because this post is not about eating. It’s about not eating. Fasting. Not for weight loss or detoxifying. Not in observance of a religious holiday or a spiritual ritual. Fasting because there are too many who go without food everyday. Fasting to appreciate what I have. 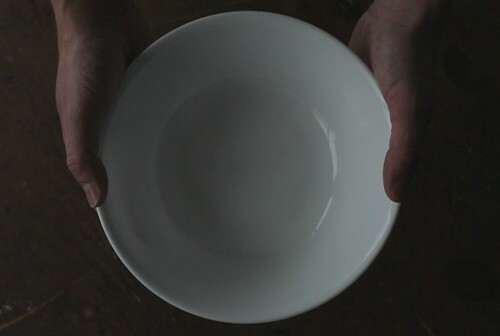 Fasting to experience just a tiny fraction of the distress felt every single day by those who are hungry. Fasting to give the money I would have spent on food for myself to hungry families in my community. Will you join me? With the Thanksgiving holiday just days away here in the U.S., I’ve been thinking a lot lately about how very fortunate I am. On Thanksgiving day, I will be lucky enough to gather with nearly 2 dozen friends and family members for a celebration that always involves absolutely ridiculous amounts of delicious food and drink. As excited as I am for a day of fun and feasting, I find that thinking of my own good fortune eventually turns my thoughts to those who are not as lucky, and wishing there was something I could do to help turn their luck around. I certainly can’t fix the hunger problem in my country (or even in my little community) all by myself, but I can make some small personal sacrifices so that others might have just a little bit more. In fact, one of my favorite inspirational and just plain awesome bloggers, Shira from in pursuit of more, has set up an organization to inspire us all to do just that. Please check out her organization, Not So Fast, and maybe even plan a fast of your own. It’s pretty simple really. Choose something to go without for a day or longer. You could go completely without food (not for any longer than a day, please), or maybe simply go without alcohol or meat or caffeine. Get creative with it. Then just figure out how much money you would have spent and give it to someone who needs it more than you. Your local food bank would be a great place to donate. So would Not So Fast. While I am only one person and I can’t change the world all by myself, there are things I can do to make it a little bit better. This Thanksgiving Eve, I choose to go without food so that a few others might not have to, even if it’s just for a day. It’s the least I can do. If you’d like to learn more about the hunger problem in the U.S., check out my earlier post that I wrote as part of Food Bloggers Against Hunger. You’ll find links to important information and ways you can help. Thank you, Kristi. I’m so glad it spoke to you. Hope you have a wonderful Thanksgiving! appreciating your compassionate action for the benefit of yourself and those in need. may your holiday with loved ones be joyful. This is a great idea and that is so very sweet that you are bringing this up on this very indulging holiday. Though I love the food, it is a lot about the gathering of family and friends. Sadly though, it has become a very commercial holiday with black Friday not even starting on Friday anymore. Thanks for writing about this. Thanks, Lilly Sue. I definitely agree with you that the best part of Thanksgiving is spending time with friends and family. Hope you enjoy the day! Beautiful Katie! So well written and gave me chills. I’m honored to have inspired even a small part of your action. All the power to you lady! We CAN make a difference. We all can. Sending love your way! Thanks, Shira. Much love to you as well.